(Phys.org) —The ability to make measurements of the biomolecular interactions that occur inside living cells is essential for understanding complex biological processes. But probing the inside of living cells without damaging them is a challenge. The cell membrane shields electrical fields, prohibiting the use of electrophoresis, a technique that is commonly used to analyze biological samples in a variety of areas outside living cells. Now in a new paper, researchers have demonstrated for the first time that thermophoresis—the movement of molecules due to a temperature gradient rather than an electric field—can be used to measure the movement of DNA and other molecules inside living cells. The paper, by Maren R. Reichl and Dieter Braun at the Ludwig Maximilian University of Munich, is published in a recent issue of The Journal of the American Chemical Society. "Our work shows that the measurement of thermophoresis in living cells is possible—moreover, in parallel across the cell and not at one single point," Braun told Phys.org. In the new technique, a temperature gradient is applied across a cell by an infrared laser. Fluorescently marked molecules inside the cell move along this temperature gradient from hotter to colder regions. 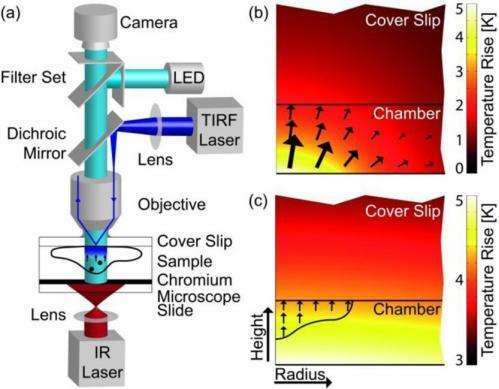 A camera can record this thermophoretic movement, with every camera pixel measuring thermophoresis simultaneously and independently. The technique can be performed in the natural environment of cells in vivo. 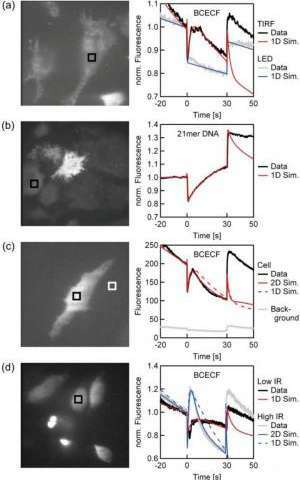 The researchers demonstrated the use of thermophoresis measurements of DNA in the cytoplasm of living cells. Interestingly, the results revealed that DNA movement in the cytoplasm is slowed down, probably due to molecular crowding. In addition to measuring the movement of DNA, the thermophoresis technique could also measure the movement of proteins, pharmaceutical components, and other molecules in cells as long as they can move through the cytoplasm. Ribosomes, for example, are so large and bound to the endoplasmic reticulum that they cannot easily diffuse through the cytoplasm, making them poor candidates for thermophoresis. One way that thermophoresis inside living cells can be used is to measure the binding affinities of molecules. As the scientists explain, the binding of a fluorescently marked molecule such as DNA or a protein leads to a change in the thermophoretic depletion strength. Binding affinities can reveal more detailed information about the interactions of these molecules. "The dream would be to record binding affinities in living cells, i.e., translating the award-winning microscale thermophoresis (MST) technique of our startup company Nanotemper into living cells," Braun said. "However, the measurement protocol is not yet robust against the shape of the cell, so some more tricks to make it work will be necessary. But we are optimistic—experimental tricks are our specialty."